The newly renovated Helen Diller Civic Center Playgrounds, located in the heart of San Francisco’s Civic Center Historic District, serve the growing number of families in the densely populated Civic Center and Tenderloin neighborhoods, creating a fun, lively space for all to enjoy. 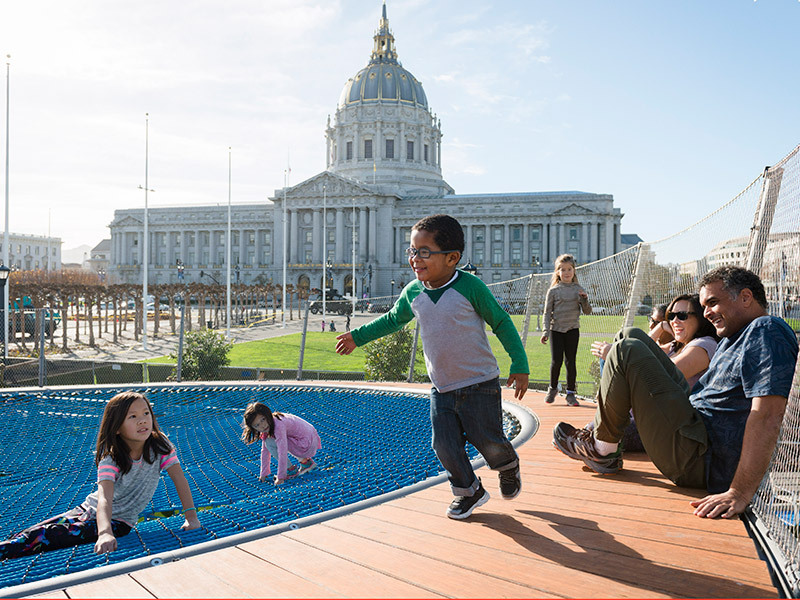 The Trust for Public Land created these two new playgrounds for Civic Center Plaza, as part of an ongoing partnership with San Francisco Recreation and Parks, and with generous donation from the Helen Diller Family Foundation. Following an extensive and inclusive community engagement process with parents, children, educators, and community stakeholders, The Trust for Public Land partnered with award-winning San Francisco based firm Andrea Cochran Landscape Architecture (ACLA) to design the playgrounds. The new playgrounds are symmetrically aligned with City Hall, inspired by nature and weather themes, and include custom designed play features.To complement the new playgrounds and activate the adjoining space is one of the largest interactive floor light display installations in the country, representing the next generation of integrating public art in public spaces. These vibrant playgrounds anchor the larger park outside of City Hall, which frequently hosts cultural events. The site is surrounded by notable institutions with programs for children, including the Main Library, the Asian Art Museum, and the San Francisco Symphony.